The Benefits of Landscaping – A Plus Lawn and Landscaping – Gastonia N.C.
Landscaping has a multitude of advantages associated with it. For health reasons, it can create a generally healthier home. A professionally landscaped yard also creates a tranquil atmosphere that not only looks beautiful but can help soothe the homeowners. For the business minded, landscaping can be a great way of raising the prospective value of your home. Lastly, for ecological reasons, landscaping can prevent the loss of precious topsoil, flooding, and the stripping of valuable nutrients in the soil. Clearly, the advantages of landscaping are numerous. However, as with any other craft, good landscaping requires both technical and aesthetic expertise that only individuals specializing in the industry can provide. That’s why it is essential to hire the professionals from A+ Lawn Care and Landscaping when landscaping. When having a professional landscaper help you with your yard maintenance, it will save you time and money on all your projects. A+ Lawn Care and Landscaping understands the importance of a healthy, well-kept yard and we offer a wide variety of services to help you create the perfect landscape. 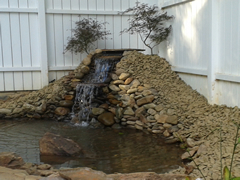 Our services include but are not limited to, retaining walls, accent lighting, irrigation installation, ornamental fountains and ponds, concrete and shrubs. With multiple different services offered, one can start to understand why landscaping is so important and why it needs to be tailored carefully. A+ Lawn Care and Landscaping is dedicated to fixing any issues our customers may have with their landscaping and we look forward to partnering with you on your next project.